Hurricane Harvey continues to bring unprecedented flooding to Texas and is now making landfall in Louisiana. 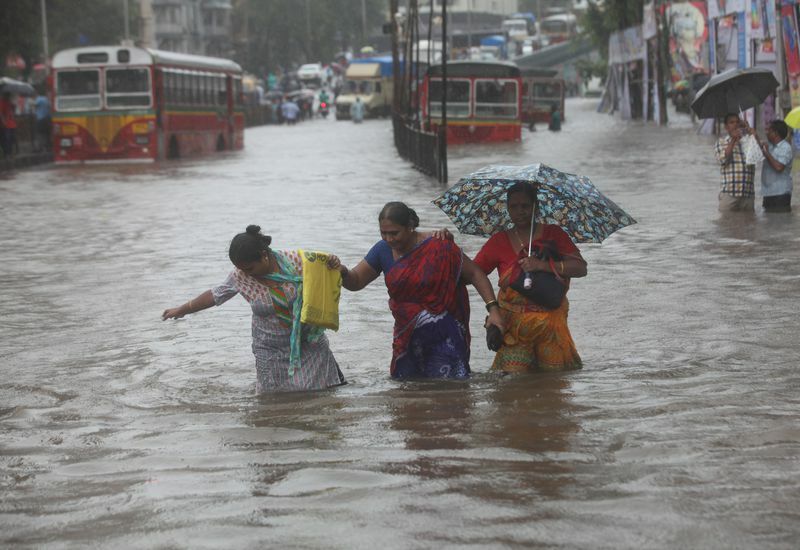 Large parts of India, Nepal and Bangladesh have been flooded in heavier than usual monsoonal rains. Niger in the African Sahel is also now experiencing higher than normal flooding with more than 40 deaths. Earlier this month torrential rain caused a devastating mudslide in Sierra Leone’s capital, Freetown, and Typhoon Hato battered Macau, Hong Kong and parts of South-Eastern China. There are two points I would like to highlight about how these events are covered in the media. First is about the relative importance we put on human lives. Hurricane Harvey has attracted vastly more media coverage than the South Asian monsoon. Both situations are still on-going, but at the time of writing the death toll from Hurricane Harvey is 30 while for the South Asian monsoon it is 1,200. If the media, and their readership, which I guess includes us all, really valued all human life as having equal value would we reflect this in our reporting and give greater media attention to where the death toll was higher? Let us simply say that our hearts go out to all those who are suffering from these extreme weather events wherever they live and whoever they are. The second point is about the causal relationship between climate change and these types of events. This has been particularly heated in the USA where climate change deniers and over simplistic arguments saying climate change caused the hurricane scream at each other. David Roberts, writing on the Vox website, makes a very intelligent and nuanced analysis of the complex relationship between individual weather events such as Hurricane Harvey and climate change. Of course hurricanes and monsoons have always killed people and the death toll is made worse by many factors such as how and where we build our settlements, but to exclude the role of climate change is simply wrong. Climate change is certainly making Hurricanes like Harvey worse as the waters of the Gulf of Mexico are warmer than was historically the case, leading to greater evaporation and precipitation, which coupled with rising sea levels, has resulted in more flooding. The US military describe climate change as a ‘risk multiplier’ or ‘threat multiplier’. They rightly see it as exacerbating many pre existing threats from flooding to terrorism in ways that are both complex and highly nuanced. The simple truth is wherever we can reduce threats and risks we should do so and rapidly reducing carbon emissions is a very doable policy. And a second simple truth is that we should value all human life equally. This entry was posted in Climate Change on 31 August 2017 by Richard. The situation in USA is very dangerous as Neo Nazis are on the rise, egged on by a President who at times seems merely narcissistic and incompetent, but at times simply evil. The Guardian has a very good editorial which puts the case that Trump is ‘beyond the moral pale’. To me, USA now feels to me much like Germany must have felt in 1934, with a clearly deranged and hate filled leader supported by a fanatical band of supporters. In many countries and at many times in history small far right racist groups exist, but then in Germany and now in USA they have taken over the reins of power. The task humanity is faced with is getting rid of Donald Trump and all he stands for as quickly as possible, yet peacefully and in such a way as to strengthen democracy. If this is not done USA faces the real danger of civil war, or of Trump making a pre-emptive attack on another country just in order to try and unite Americans behind him. Heather Heyer was killed in Charlottesville while peacefully protesting against the Neo Nazis assembling there. 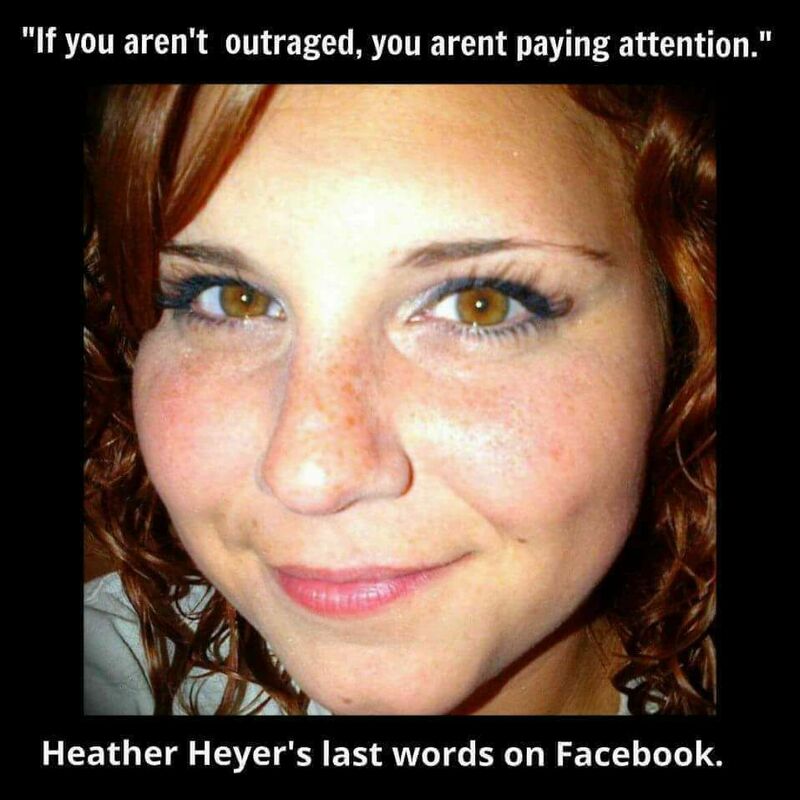 Her last words on Facebook were ‘If you aren’t outraged, you aren’t paying attention.’ Trump’s failure to clearly condemn the forces that killed her means he is totally unfit for office. Theresa May foolishly invited him on a state visit to the UK, which apparently he still intends to accept. This is comparable with inviting Hitler on a state visit to the UK in 1934, at that stage where he was in power, but while there was still an opportunity to limit the damage he was to do. Evil leaders must be opposed, strongly, peacefully and by the vast majority of ordinary citizens standing up for what is right. If Trump visits Britain the demonstrations will probably be the biggest in the history of this country. I would expect millions to be on the streets. One of the lessons from the Nazi era was that by staying silent we are complicit in evil. Good people must stand up and speak out. In USA the ordinary citizens must join together to oust Trump. We have seen many Republicans distancing themselves from Trump: they need to go much further. I would like to see the majority of people encouraging politicians from across the spectrum of respectable political beliefs to work together to create a less confrontational and hate generating system of politics. The key is local people organising in their own communities but some top down leadership would also be useful. I’d like to see Jill Stein of the Greens, Bernie Sanders, Hilary Clinton, Jerry Brown and Barack Obama from the Democrats sitting down with respected Republicans such as George Bush, George W Bush, John McCain and perhaps Mitch McConnell and Paul Ryan. They may not agree about much, but rescuing American democracy ought to be a sufficiently unifying project. The most important thing is to change the tone of political debate. It has been too adversarial, confrontational and tribal for years. Putting proportional representation on the agenda might be the first step to help bring about a more collegiate atmosphere. American people are desperately insecure and atomized. A universal citizen’s income, free health and education would help to transform American people to feel more safe, secure and less susceptible to give their support to hate filled populist leaders. But these are just my ideas. The new ideas and main opposition to Trump has to come from within American Society. Today I want to pay tribute to Heather Heyer and to the millions of Americans who are standing up, speaking out and putting their bodies in harm’s way in the interests of democracy. This entry was posted in Politics on 17 August 2017 by Richard. I’ve blogged before about solar cells being integrated into ships and planes, and this week I came across a story of Indian trains having them, and many experimental solar cell clad cars compete each year in a race across Australia. 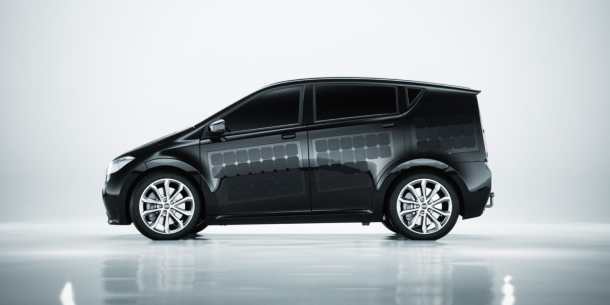 It now looks likely that the first solar cell clad car is going to go into commercial production, assuming it can get 5,000 pre-orders. Munich based start-up Sono Motors have just successfully Crowdfunded and launched the Sion. (Great videos) It looks to me to be the coolest electric car in the world and is being sold for the very modest price of £14,500 or 16,000 Euros, excluding the battery, which currently costs an extra 4,000 Euros, but this figure is falling rapidly as battery prices continue to come down. Currently the world’s largest selling electric car is the Nissan Leaf, despite the Tesla’s massive hype. The Sion will be considerably cheaper than either of these, and has a lot of additional features, such as the solar cells, that make it very much cooler. Perhaps the most novel feature is its living moss air filter. The battery has a power take off so that it can be used to charge up other electric cars, for power tools or to sell electricity to the grid. It is a family sized car totally covered in 330 high specification solar cells, which even on a cloudy day should generate enough electricity to drive 30Kms. With a full battery it has a range of 250Kms. The car is designed for car sharing and lift sharing and comes complete with apps to help these systems. The UK government has announced its predictably unimpressive goal to rid the country of diesel and petrol cars by 2040. As one might expect much of the press and the incumbent motor industry is bleating about how this could undermine the existing motor industry or require many new power stations. The reality is that this is part of a globally disruptive series of changes that are needed to tackle a human health crisis and the climate crisis. Getting people out of their cars and into public transport is clearly happening in many cities around the world, and needs to happen on a very much greater scale. I, like a growing number of people do not own a car but share the ownership and use of a number of cars through a car share club. Our club, St James and Bartonsham car share club currently owns four cars, all still fossil fuelled. We hope before too long to switch to electric or hydrogen fuel cell. I’ve written before about Riversimple’s Rasa, probably the most sustainable and best car on the planet. The Sono Motors Sion looks to me to be another one of the best. Note Sono like Riversimple is a tiny start-up. Most of the big volume car makers now have all electric models, but none seem to be so ground breaking as the Rasa or the Sion. Globally it is estimated that the fossil fuel industry is being subsidized to the tune of $5 trillion per year. We should curtail all such subsidies immediately and aid the speedy end of ‘The Fossil Fuel Age’ and invest in the coming ‘Solar Age’. In the UK electric car sales make up just 2% of new car sales, while in Norway the figure is 42%. The mayor of Oslo says that she wants her city to have the cleanest air of any city in the world. Reducing the number of cars on the road, having as many of them as shared use as possible and making sure that the actual cars are as minimally polluting as possible are all part of this desired policy, and the Rasa and Sion seem to me to be the cars that best fit this goal. This entry was posted in Transport on 12 August 2017 by Richard. In February I blogged about the exponential growth of solar pv and the disruptive effect this will have on existing power systems. A couple of stories have come my way that highlight the changing economics and technologies. Togo, the small West African country, provides an interesting example of how the cleantech revolution is progressing. It is one of the least developed countries in the world. Only 7% of the rural population have access to electricity. This is about to change very quickly. A couple of weeks ago UK start-up BBOXX signed an agreement with the government of Togo to bring solar power to 300,000 people. BBOXX supply solar panels, batteries, smart appliances and remote monitoring. Most of the rural population of Togo do not have access to conventional banks. All manner of financial transactions are now done in Africa by mobile phone, including of course for BBOXX’s electricity. The combination of solar panels, batteries and mobile phones is replacing the need for both conventional power stations and banking systems. 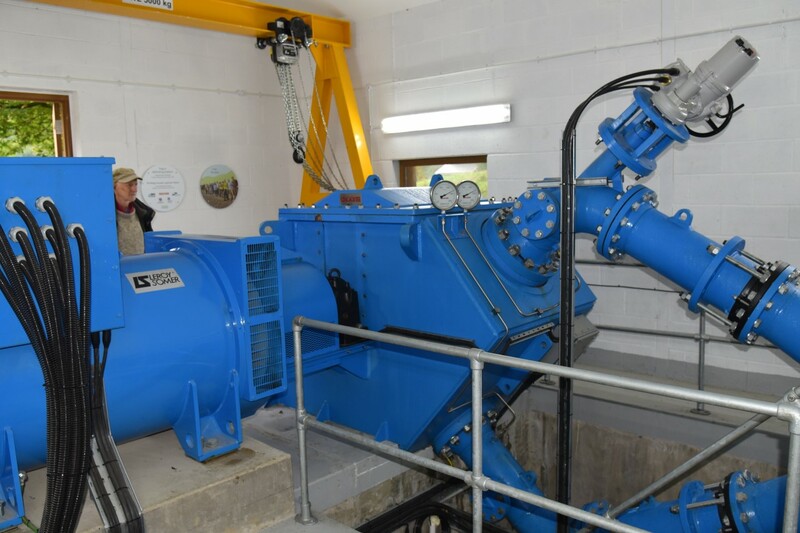 One of the priorities for the Togolese government in this project is to bring financial inclusion as well as electricity to rural populations. 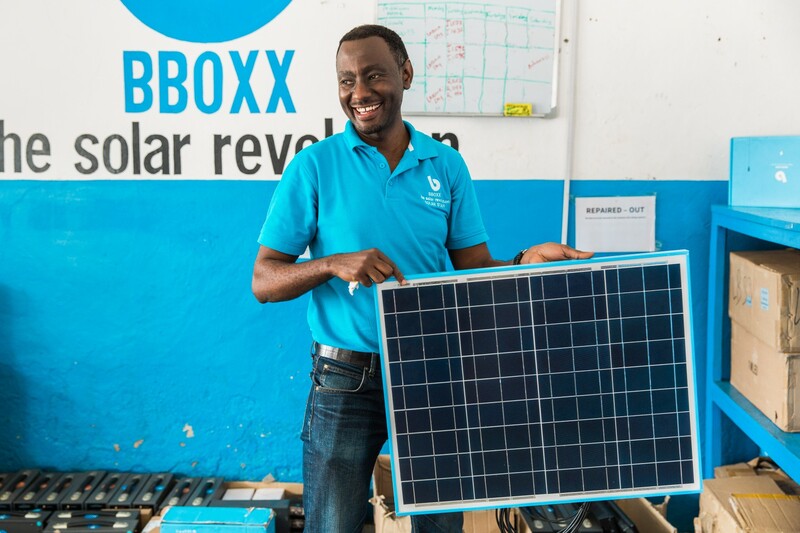 BBOXX expect to bring their solar electric system to 20 million people, mainly across rural Africa and South Asia, by 2020. In South Carolina, USA, two partially built nuclear reactors have been abandoned at huge cost to the local people. Gains in energy efficiency, cheap gas and cheap renewables have pushed down demand and power prices. Westinghouse has gone bankrupt and the number of operating reactors in USA is falling as old ones are decommissioned and very few new ones are being built. The nuclear renaissance that some commentators were talking about a few years back looks unlikely. This has ominous implications for the viability of UK’s investment in Hinkley C.
South Carolina currently gets 55% of its electricity from nuclear and 40% from coal and gas, and remarkably little from renewables. I would expect this to change very quickly despite Trump. The combination of increases in energy efficiency and the falling costs of renewables look set to have a growing global impact, even in South Carolina. One example is the Tesla solar roof tile that I blogged about last November. 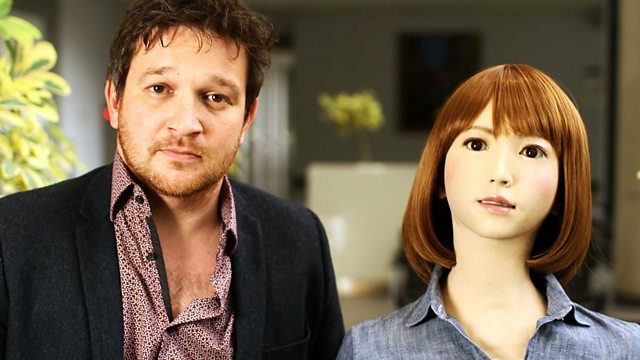 I would expect it, and similar products, to grow extremely rapidly. The stock markets sense this direction of travel, so as Westinghouse collapses Tesla soars. Fracking has brought cheap gas to the American market, but at huge environmental cost, and even it is failing to compete with renewables on cost. In 2016 for the first year ever in American history solar added more new generating capacity than any other energy source, adding 14,626 MW. This marks an annual growth rate of 95%, similar to China and many other countries. Expect exponential global growth of solar to continue for some time yet. Good news for people everywhere, from rural Togo to Jenkinsville, South Carolina. This entry was posted in Energy on 2 August 2017 by Richard.